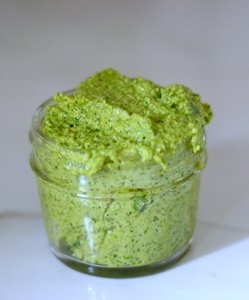 I am a pesto lover of note – I can’t think of a thing that doesn’t go well with some or other pesto, and I’ve made pesto out of anything – literally anything – that can be pesto’d! Try this Pumpkin Seed Pesto for something deliciously different this weekend. 1. No rocket science needed here! Put all into a blender or NutriBullet and puree.